Barge holidays in England provide a great opportunity to discover the English countryside, whether you choose to see your local waterway from a different perspective or to take a canal boating holiday further afield. The canals and rivers of England were originally built to transport industrial goods to and from towns and cities by boat. Today, the UK waterways are at the heart of "staycation" holidays and weave through some of the most picturesque areas in the UK. If you are looking for a lock free, rural canal then a boating holiday on the Ashby Canal is ideal. Spanning twenty two miles, this peaceful waterway meanders through a mixture of forestry and farmland. The Staffordshire & Worcestershire Canal is another scenic canal, a winding route, leading your hire boat under bridges and past pretty cottages, with weeping willows and wild flowers en-route. You'll find something for all the family on a boating holiday, local family boating holiday attractions close to the inland waterways include Cadbury World, Warwick Castle and the Roman Baths at Bath. 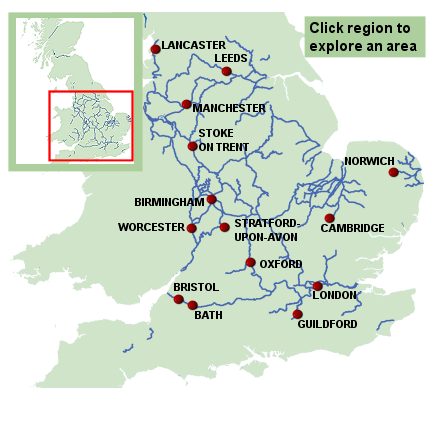 For more information about canals and rivers near you, view our boating holiday map. The waterways of northern England boast some of the most breathtaking of canal scenery. Perfect for the more adventurous boaters, you can cross the majestic Pennines on your boating holiday and appreciate the stunning contrasts between our industrial heritage and countryside, with fantastic views under wide open skies. You'll discover historic Victorian mills, plenty of friendly local puns and rugged stone-built towns, with unique shops, resaurants and boutiques. More about canal boat hire in Northern England. The heart of the canal network, a boating holiday in central England might include a journey through Shakespeare's Country, a trip to Cadbury World or a family day out at Warwick Castle. With more canals than Venice, industrial heritage and shops galore, Birmingham is a popular boating holiday destination. The hub of the working canals, the waterways of central England played an instrumental role in transporting goods such as coal between London and Birmingham. More about canal boating holidays in central England. Whether it be a city break or a rural holiday, the waterways of southern England are full of variety. Londoners will be pleased to hear that within about an hour's drive of the city, the River Wey and the Basingstoke Canal are amongst the most peaceful waterways and ideal for a relaxing getaway. Active parties will be impressed by the Caen Hill Flight near Bath on the Kennet and Avon Canal. A 'Waterway Wonder', the Caen Hill Flight of 16 locks is part of a larger flight of 29 locks at Devizes. More about Southern England boat hire.